Makes a great St. Patrick's decoration, or turn it upside down and fill it with candy! 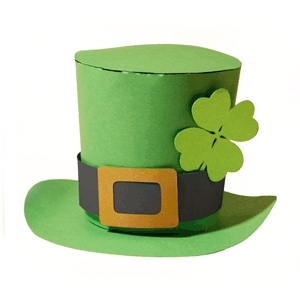 Instructions: Cut 6 pieces: top, side, brim, hatband, buckle, shamrock. Form side piece into a cylinder, overlapping edges, glue tab inside. Bend small tabs at top of side piece towards inside of cylinder, apply glue to top of tabs, attach top of hat (circle) to tabs. Bend tabs on brim upwards, apply glue to outside of tabs, slip tabs inside cylinder, press each tab firmly to attach. Wrap hatband around hat, overlap ends at back, glue. Glue buckle to front, tuck shamrock into hatband, glue down.